Yes, folks, it’s a rainy, slow Saturday. I love my blog, I do. And, I love to write. But, I will resort to incorporating some of the WordCount Blogathon‘s theme day suggestions in order to keep posting each and every day in May. Here’s one: a super cool design site that creates a “Wordle” or word picture based on common words or blog posts. 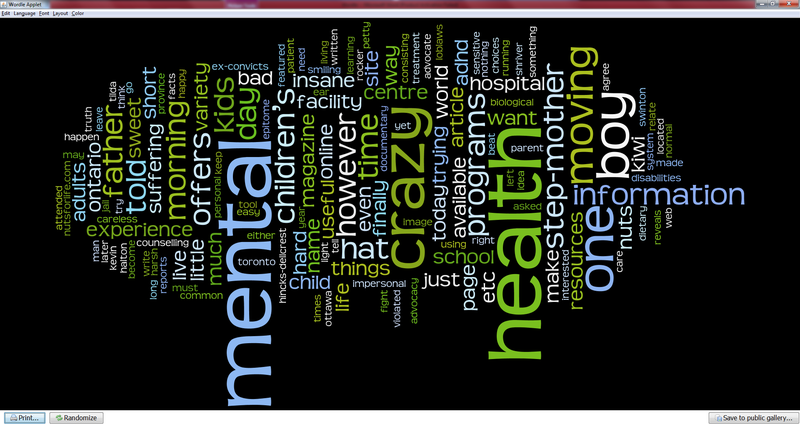 This is my Kids and Mental Health Wordle. Lovely, ain’t it? This entry was posted in Philosophy, Social and tagged children, creativity, feelings, introduction, philosophy, socializing, thinking. Bookmark the permalink. ‘Tis lovely, Lisa! Whoever thought Wordle up was brilliant. I agree with Lisa, lovely. And I like the colors, too.